When you are a first time dog owner, choosing the best dog step or stairs can be quite challenging. To make an adequate and educated decision, first you need to understand that there is no difference between dog steps and dog stairs. The two terms are used interchangeably. Pet stairs/steps are specifically designed to provide our canine babies with comfortable and easy access to any elevated surface. They can be used to help dogs get into vehicles, sofas, beds, armchairs and other pieces of furniture. Portability – permanently fixed or portable. Overall height – the higher the reach is, the longer the step/stair it should be. Depth of steps – deep and roomy steps are easier to climb and maneuver. A rule of the thumb is that each step should be 10-12’’ deep. Width of steps – wider steps are also easier to climb and maneuver. Weight limit – before purchasing, compare the stair’s weight limit with your dog’s weight. Depending on what they are made of, even sturdy looking stairs may not be suitable for big dogs. Materials used – steps and stairs need to be made of durable materials powerful to withstand different loads. The frame should be made of steel and the surface should be covered with a non-skid material. Indoor steps and stairs should be made of more lightweight materials like foam or plastic. 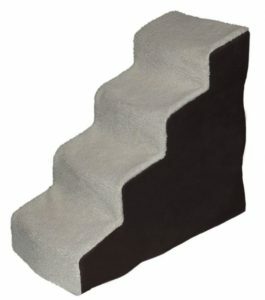 Bottom grip–the bottom of the step/stair should be rubberized to avoid sliding on the ground. Additional features – foldable designs for easier storage and special locking systems to prevent unwanted openings. They come in different colors and designs that complement your interior décor. In a nutshell dog steps/stairs are beneficial for all dogs that need to refrain from jumping or cannot jump at all because of their small size or health condition. If your dog does not know how to climb stairs it may take a while to get used to them. To help you decide which dog step/stair suits your needs best, we have reviewed 6 different products. 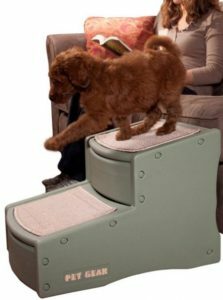 The Easy Step III Pet Stairs by Pet Gear, as the name suggests itself, is a 3-stepped stair, suitable for dogs and cats. The three steps are deep, wide and with a slight incline. The step’s height is 6’’. The first two steps are 9.5’’ deep, while the third step is 9’’ deep. The bottom of the stair is covered with rubber grippers to keep the stair stable and in position. The stairs are covered with carpet threads which can be easily removed for cleaning. The carpet threads are suitable for machine washing. The Easy Step III Pet Stairs by Pet Gear is designed to snap easily for simple setup. Additionally, the stairs weight less than 15 pounds which makes them easily portable from one location to other. The stairs are suitable for outdoors usage. 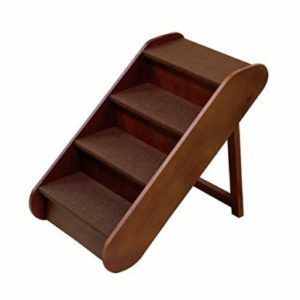 The Easy Step III Pet Stairs by Pet Gear is available in 4 different colors – cocoa, chocolate, tan and sage. The stairs come in two sizes – for dogs up to 50 pounds (25’’ in length, 16’’ in wideness and 23’’ in height) and for dogs up to 150 pounds (18’’ in length, 14’’ in wideness and 16’’ in height).Generally, the stairs are suitable for extra small and toy breeds, small breeds and medium breeds. The Easy Step II Pet Stairs by Pet Gear is a two stepped stair, suitable for placing against beds, sofas, chairs, tables and other hard-to-reach, elevated areas. The steps are wide and deep, allowing both smaller and bigger dogs to comfortably and securely climb up and down. The steps are conveniently inclined to maximize the practicality. The bottom step is 6’’ high and 11.5’’deep, while the top step is 6’’high and 12.25’’. Additionally, the steps are covered with carpet threads which can be easily removed for cleaning. The carpet threads are suitable for machine washing. The rubber grippers on the bottom secure the product in one position, thus preventing unwanted sliding. The frame is made of durable plastic. The Easy Step II Pet Stairs by Pet Gear can be easily snapped without any tools. The snapping feature is important for easy storage when not in use. Additionally, the stairs weigh around 5 pounds which makes them easily portable from one location to other. The stairs are suitable for outdoors usage. The Easy Step II Pet Stairs by Pet Gear is available in 4 different colors – cocoa, chocolate, tan and sage.The stairs come in two sizes – for dogs up to 75 pounds (17’’ in length, 14’’ in wideness and 13’’ in height) and for dogs up to 150 pounds (22’’ in length, 16’’ in wideness and 16’’ in height). 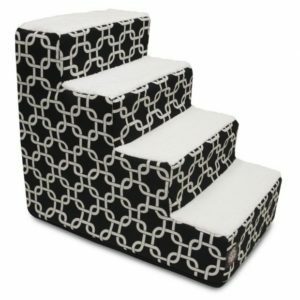 The Portable Pet Stairs by Majestic Pet is made of sturdy foam insert and durable, upholstery-grade, polyester fashionable fabric. The base material is heavy-duty, waterproof 300/600 denier. Because of the foam insert, the stair will not cause bruises if you happen to bump into it. The upholstery fabric cover can be easily removed and machines washed on gentle cycles and then tumble dried. The steps are additionally covered with soft cushions to avoid potential injuries. The Portable Pet Stairs by Majestic Pet is quick and easy to install. However, for maximum sturdiness and security, the stair needs to be paced in corners, against furniture or walls. The stair is best suited for indoors use. The Portable Pet Stairs by Majestic Pet is available in two size versions. The first version is a three stepped design (dimensions - 18" depth x 15" height x 16" width) and the second version is a four stepped design (dimensions - 24" depth x 20" height x 16" width). The stairs are available in many different colors –black, grey, navy blue, red, teal and yellow. The weight limit of the product is 25 pounds. Not suited for outdoors use. The Easy Deluxe Soft Step Pet Stairs by Pet Gear features wider, deeper and appropriately angled stair landings practical for both smaller and bigger dogs. The stairs are made of plastic frame covered with polyester material. Additionally, the steps are covered with soft plush fleece material that can be easily removed and machine washed. The plush fleece gives extra comfort when stepped on. Each step is 6’’ high. The bottom of the unit is underlined with nonslip rubber layer to avoid dangerous slipping and sliding. The Easy Deluxe Soft Step Pet Stairs by Pet Gear is designed to snap easily for simple setup and storage when not in use. The stair is lightweight and easily portable. It can also be used outdoors. 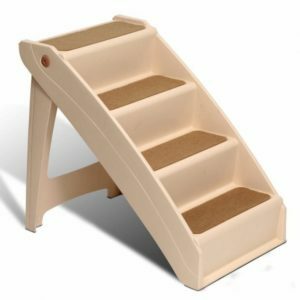 The Easy Deluxe Soft Step Pet Stairs by Pet Gear comes in three size versions – Step II Deluxe, Step III Deluxe and Step IV Deluxe. The Step II Deluxe is suited for dogs up to 75 pounds and measures 17’’ in length, 14’’ in wideness and 13’’ in height . The Step III Deluxe is suited for dogs up to 150 pounds and measures 25’’ in length, 16’’ in wideness and 23’’ in height. The Step IV Deluxe is also suited for dogs up to 150 pounds, but measures 33.5’’ in length, 16’’ in wideness and 33.5’’ in height. The PetSafe PupSTEP Foldable Wood Pet Stairs by Solvit is the perfect stair for small to medium dogs. The step size and spacing are specifically designed to offer comfort and security. It is made of wood construction with rich, walnut stain. The wooden construction is tested to sustain 150 pounds. For additional security, the stairs feature built-in side rails. ​The PetSafe PupSTEP Foldable Wood Pet Stairs by Solvit can be folded flat for easier transportation or storage. When in use, the stairs offer maximum support and stability without the need to be laid against other surfaces. The stairs do not need to be assembled. The PetSafe PupSTEP Foldable Wood Pet Stairs by Solvit comes in two sizes – large and extra large. The large stairs have 3 steps and measure 24’’ x 16’’ x 20’’ inches. The extra large stairs have four steps and measure 30’’ x 19’’ x 25’’. Additionally the product comes with non-transferable limited lifetime warranty. The PetSafe PupSTEPPlus Pet Foldable Stairs by Solvit is a lightweight but durable stair, specifically designed for medium to large dogs. The built-in side rails ensure secure usage, while the non-skid feet keep the stairs stable on the ground. The steps are covered with slip-proof material. The modern styling of the stairs can blend in any décor. The PetSafe PupSTEPPlus Pet Foldable Stairs by Solvit can be folded for easy storage when not in use. Additionally, the stairs can be easily transported because they weight only 9 pounds. In spite of their weight they are sturdy enough to support up to 200 pounds. The stairs can be used outdoors. The item can be easily cleaned with a mild household cleaner. The PetSafe PupSTEPPlus Pet Foldable Stairs by Solvit measures 24’’ x 16’’ x 20’’. Each step is 15’’ wide, 7’’ deep and 6.25’’ high. The stairs are available in one size and one color. The stairs come with a lifetime warranty. All in all, it can be concluded that dog steps and stairs are a life-saving tool especially for dogs who cannot or are not supposed to jump. 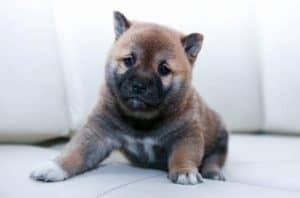 What is more, they are beneficial for you too, as they eliminate the need of you having to lift your dog every time it wants to get on the bed or get inside the car. In a nutshell, dog steps and stairs make life easier for everyone. However, with so many choices available on the market, making the right choice can be daunting. To make an educated decision it is important to do a little research before making the final choice. Many online articles offer helpful tips related to the subject. Additionally, you can always consult with the salesperson at your local pet store. Consider all options and compare them to your budget limit to make the ultimate decision. Keep in mind that even the best stair will not work if your dog does not want to use it. Your dog will need to get use to getting up and down the stairs. It might take some treats to do just that but the overall benefits of these stairs makes it worth while.